Almost all pet parents must have seen cases of allergies exhibited as a rash and/or scratching by the dog, without any obvious reason or change in immediate environment. Most of these cases respond poorly or temporarily to medications and warrants an investigation targeted towards identifying the causative allergen. All dogs showing allergic symptoms should be suspected for food allergy. Although, there is no difference in the susceptibility of food allergies in male or female dogs, some breeds such as Terriers, Dalmatians, Collies, Labradors, Dachshunds and Boxers, seem to be more prone. Food allergy can appear at any age and physiological stage but cases seems to occur more during periods of active growth, with almost 40 percent of all cases are of dogs less than one year old. A food allergy is an abnormal immune response to an individual food or additive. Animals eat a variety of processed food proteins, fillers, and colourings, which are further processed inside their bodies. Proteins in food may be combined or changed into substances recognised by the immune system as foreign invaders to be attacked. The resulting inflammation may target the GI tract or other organ systems but, in dogs, it is the skin that most often suffers from this immunologic activity. Symptoms of food allergy: The symptoms of food allergies are similar to those of other allergies affecting skin in dogs. The most common areas of involvement include the ears, feet, inguinal region, proximal anterior forelegs, periorbital region, and muzzle. Symptoms typically include rashes and hair loss. Ear canal diseases that manifest as severe itching and complicated by secondary infection are common and may be the only presenting complaint. All the symptoms may vary from moderate to severe. Suffering dogs show inconsistent response to antibiotics and injectible steroids. In 10-15 percent cases, digestive disturbances can also occur in combination with skin lesions. Food allergy is not about diet change: It is often assumed that food allergy is due to diet change of some sort in recent past. However, in fact, food allergy requires time to develop and in many cases animals may become allergic to foods, they have been eating. Food allergy can increase sensitivity: Another interesting fact about food allergy is that it can increase the sensitivity of the dog towards other types of allergies such as flea and parasitic allergy. Another aspect of food allergy is its appearance year-round as compared to other allergies (such as flea allergy dermatitis), which may be seasonal. Food allergy is not food intolerance: Often food allergy is confused with food intolerance, which results from the inability of the pet to digest a particular food (such as lactose intolerance). 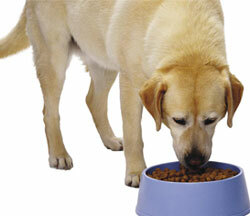 Food intolerances are far more common in dogs than food allergies. Food intolerances, primarily affect digestive system without affecting skin or ear. Moreover, food intolerances do not respond at all to steroids or antibiotics. Most common allergens in dogs are meat protein, milk proteins, albumin from eggs, gluten from wheat and soybean protein, all of which are also the most common ingredients. The potential allergenicity of a food does not depend on the amount of protein or proportion of amino acids in the food; however, it mostly depends on the structure and size of the glycoprotein in the food. Beef and soybean have been reported to be the most common food allergens. Preservatives and flavorings are often confused as a source of food allergies, but studies have shown that they are not the causes, and while we may not have justifiable health concerns about preservatives, food allergies is not one of them. Allergy woes: As allergy is just extra-responsive immune system, body of the animal may become responsive to many allergens at same time, thereby giving rise to multiple allergies. Therefore, animals having food allergy may also show signs of other allergies, and therefore, will also respond, if treated for other allergies. This makes it further difficult to conclusively diagnose the food allergy and to pinpoint the causative allergen. Atopy, flea bite allergies, intestinal parasite hypersensitivities, sarcoptic mange, and yeast or bacterial infections can all cause similar symptoms as food allergies. Once all other causes have been ruled out or treated, then it is time to perform a specific investigation for food-allergy known as ‘hypo-allergic diet trial’ or ‘restricted antigen dietary trial’ needs to be done. The hypo-allergenic diet trial: The basic principle of this trial is to feed a “hypo-allergenic diet” to the animal for a set period of time, which is mostly three months. Regardless of the diet used, it must be the only thing the animal eats during this period. Although some dogs having food allergy positively responds to hypo-allergenic food in two to three weeks, many of the pets may take 12 weeks to respond. 80 percent of food allergic dogs will have responded to diet trial at least partially by six weeks. The Labrador Retriever and Cocker Spaniel appear to require up to 10 weeks of trial diet before showing a response. If the animal recovers, the animal is further ‘Provocatively challenged’ by feeding original diet again for up to two weeks to see if there is relapse of the symptoms. This is essential for confirmatory diagnosis. Food allergy is confirmed if there is recovery with the test diet and allergy with the original diet. Usually the relapse does not take more than two weeks of feeding in cases of food allergy. However, it appears that the duration between the challenge and relapse of symptoms may differ depending on the offending ingredient. The animal is then returned to an appropriate commercial hypo-allergenic food indefinitely. In some cases, a second food trial with a different novel protein may be required to confirm the diagnosis. Most crucial and cumbersome part of conducting this trial is to formulate a hypo-allergenic diet. The traditional method is to use a “novel” protein and carbohydrate source, which is actually something the animal has never eaten before. For many years, mutton was a preferred ingredient for formulating hypo-allergenic food across European and American continent as the dog-food available at these places is primarily beef based. However, under Indian conditions, dogs are mainly fed food based on chicken/mutton/chevon, eggs and milk as principal protein sources; therefore, using beef or some irregular vegetable protein source seems to be a feasible option for formulating such diets. Some of the commercial pet food brands are preparing such diets. Treatment of food allergies: There is no absolute treatment for food allergies and animal has to be kept on food completely free of the identified allergen. Administration of antibiotics and steroids along with antihistamines can help in providing symptomatic relief. (Dr Yasir Bashir, Dr Ankur Rastogi, Dr RK Sharma, Dr Pratiksha Raghuwanshi belong to FVSc & AH, SKUAST, Jammu and Dr Nazam Khan belongs to NDRI, Karnal).